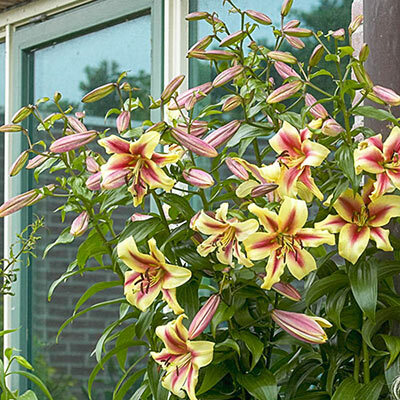 Dutch hybridizers gave us all quite a gift when they crossed exotic Oriental lilies with stunning trumpet lilies! Our Giant Hybrid Lily Lavon is one of the results of them magical combination. 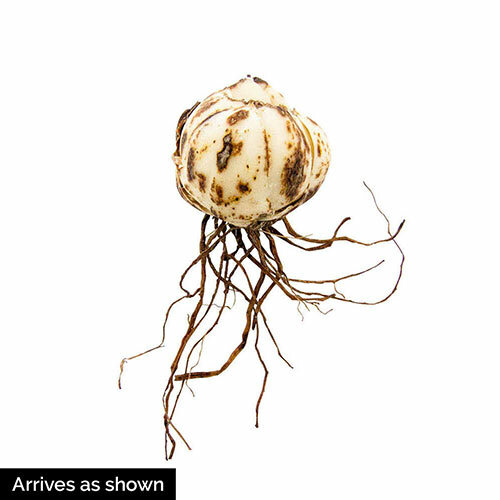 Like all Orientals, Lavon bestows big, fragrant blooms of 7-7½" across. But that's not all, it also takes its shape from the trumpet parentage, producing well-formed lilies of golden yellow overlaid with delicate blushes of soft red. Strong stems keep these amazing blooms upright and visible for years to come. They can reach 3-4' tall within the first year alone. By the second year, they can shoot up to 5-6', and within three years these lilies can reach as high as 6-8' with masses of blooms to enjoy.